You may have heard people joke about being "mouth breathers," but when you spend most of your time breathing through your mouth instead of your nose, it's really no laughing matter. Breathing from your mouth -- especially in children -- can cause malformations of the face and jaw, bad sleep, gingivitis and digestive disorders. The body also tends to take in less air when you breathe through the mouth, which can result in chronic oxygen deprivation. It's simple enough to say "just close your mouth" in order to fix the problem, but in case you need more help than that, try a few things recommended by medical professionals. 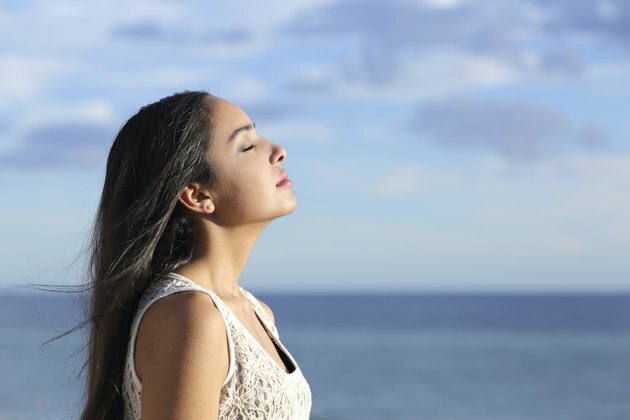 Remind yourself to breathe through your nose as often as you can. Write a note for yourself at your desk, or set a little reminder on your smartphone that reminds you to keep it up. Sit up straight, close your mouth and press your head back a little as you take in a few deep breaths through the nose. A lot of mouth breathers maintain a head-forward position, which can result in poor posture and back problems as well as poor breathing. Perform a "nose-clearing" exercise whenever your nose feels too blocked to take a good breath through it. Called the "Buteyko" breathing method, it's recommended by Australian breathing therapist Dr. Rosalba Courtney. Close your mouth, breathe in through your nose and then back out through your nose, and then pinch your nose closed with your fingers. Hold your breath out. When you need to take another breath, let go and inhale forcefully through your nose. To add challenge to the exercise and further train yourself to breathe through your nose, hold your breath for as long as you can before inhaling through the nose. Progress even further by holding your breath while walking in place. Use a nasal saline spray or a neti pot to clear your nasal passages, if they're feeling especially blocked. Some people avoid nose breathing because their passages don't provide enough space for adequate air, so these remedies may help, suggests New York-based sleep and breathing expert Dr. Steven Park. Remove known allergens from your home, and especially your sleeping area. Allergens can create blocked nasal passages. Wash your sheets often in hot water, and remove any rugs or dusty items from the bedroom. Also consider not letting your pets sleep in the bedroom. Get regular exercise. Mind-body exercises such as yoga often include breath work, which can help you focus on breathing through your nose. Regular aerobic conditioning can also help train your lungs and heart. Exercise gets your sympathetic nervous system working harder, which will constrict the blood vessels in your nose, suggests Dr. Park. If you're continuing to breathe through your mouth at night and often snore, consider using nasal strips that open the nasal passages. You can also purchase chin straps that force you to keep your mouth closed. Talk to your doctor about the options, as she may have other suggestions specific to your condition. Never hold your breath or nose-breathe to the point of feeling dizzy or light-headed. If you simply can't breathe through your nose at all, it's crucial to visit your doctor to discuss the issue.